In 1980, the white on blue plates had reflectorized numbers. In 1981, instead of replacing the plates as usual, a decal was used to validate the plates through 2/82. Decals were used in some form through the 1997 expirations, on several different bases. 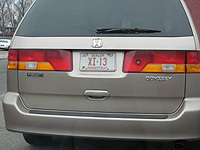 In 1996, for the 1998 expirations, new plates were issued. These plates were for 2 years, and stamped with the month and year of expiration. Every two years since, the colors of the plates have changed. Also at this time, larger dealerships began to receive plates with three prefix letters - i.e., after reaching 'XY-', a plate with 'XAA-' was issued, followed by 'XBA-' and so on. Dealer and Repair plates can now be seen with a letter suffix, e.g. X-123B instead of XB-123. It appears that these may be replacement plates for lost or damaged ones. Help us! We're working on compiling a list relating new car dealer numbers to specific dealerships. Take a look at where we are now. Also, I thought it would be neat to line up all of my one- and two- digit new car dealer plates. I don't have many yet, but if you have one I need which you'd like to sell or trade, let me know! This was the last year for this style plate, and also the last year for stickered dealer plates. This plate is an error plate; it has a dot separator. The dot didn't officially appear until the 1998 expirations. The beginning of more changes to dealer plates. Starting with the 1998 expirations, new plates were issued every 2 years. Rather than decals, the expiration date was embossed into the plate. Three-letter prefixes were introduced for larger dealers with the 1998 or 1999 expirations. Previously, once a dealer reached XY- it received a second number. The colors are now changed every 2 years. The little map icon started appearing on dealer plates at this time as well. There were a few dealer plates made for 2000 which didn't have the dot separator. Unlike the 1987 plates above, these were now the exception. 2001, with the normal dies for the serial 2001 with the new, skinny dies for the serial. This may have been a re-made plate number. There are not many 2001 plates with these dies used. This is an odd one. Most of the 2002 expirations have the new, narrow dies. For some reason this one has the old large ones. Another 2002 from the same dealership, but with the usual skinny dies. 2003. New Car Dealers receive a set of plates starting at XA-... ...running through XY-. XQ- and XZ- are skipped, making the set consist of up to 24 plates. If it's a large dealership requiring more plates, they stick another 'A' on at the end and continue on at XAA-... ...going through however many plates the dealership needs/is eligible for, in this case up to XOA-. 39 plates in this dealership's set.